A brand that has championed the course of online shopping in Nigeria is Konga. With its online and offline retail platforms, Konga has consistently set the standard on which other brands in its industry build on. Having earned the game changer title in the e-commerce industry in Nigeria, Konga keeps expanding its reach and gaining more traffic. With all its accomplishment, Konga is a brand worth reviewing. Check out Konga in a wrap. In 2012, a Nigerian entrepreneur and businessman called Sim Shagaya founded what we now know as the largest online mall in Nigeria, Konga. The e-commerce company has its headquarters in Gbagada, Lagos State and offers a third-party online marketplace and first-party direct retail. The company started out as a Lagos based online retailer with a product range of children items, beauty and personal care products. By the end of 2012 and early 2013, Konga increased its merchandise categories to include home appliances, electronics, health care products, and fashion. Within this period, the company also expanded to other parts of the country. In 2013, the company shifted its focus from being a purely first-party online retailer by launching Konga Mall, a platform for third-party retailers. This was achieved with a $10 million Series A round investment raised by the company’s investors, Investment AB Kinnevik and Naspers. With the help of the same investors, Konga was able to raise a $25 million Series B round which was considered as the largest single round raised by a single African start-up. Struck by some strokes of an incontrollable online traffic, the site, Konga.com crashed on November 29, 2013 and operated offline for 45minutes. This was due to its Black Friday promotion which brought about an enormous sale. Rebranding itself during the launch of the third-party retail platform in 2014, Konga changed the initial ‘Konga Mall’ to ‘Marketplace’. This new platform beat the previous internal target of 1000 merchant by featuring 8000 more. During this season, Konga experienced tremendous growth from millions worth orders. More recognition came in January 2015 as Konga was recorded to be the most visited website in Nigeria. The CEO, Sim Shagaya, also referred to it as a leader in its field. In June 2015, Konga acquired the assets and mobile money license of Zinternet Nigeria Limited. This acquisition was used to support its premier product, KongaPay, which was a solution for cashless electronic payment. Konga, partnering Nigerian commercial banks, like Ecobank, Access bank, FCMB, Diamond Bank, Zenith Bank, Heritage Bank, UBA, First Bank and GTB, launched KongaPay. Konga, again set the pace for other e-commerce brands with this innovative move as it made payment easily for many customers. Despite its many wins, Konga tasted some tough times and had to lay off over half of its staff. As a result of this downtime, Konga was acquired by Zinox, a manufacturer and distributor of computers. As a result of the acquisition, Olusiji Ijogun, former UAC Foods and Unilever executive, was appointed as the company’s chairman while Nick Imudia became the CEO after Shola Adekoya resigned. A merger between Zinox and Konga.com followed on 1 May 2018 but the brand name, Konga was retained. The new company is a combination of an effective online e-commerce and the expansive branch network of Konga.com and emerging retail outfit, Yudala, whose goal is to pioneer omni-channel in Africa. The new Konga was forecasted to become the biggest e-commerce and retail company in Africa. Konga Express: A service forced on delivering ordered products to customers within 1-3 days. Konga Marketplace: This serves as a platform for Nigerian based businesses to showcase their products. Konga Self-Fulfill Model: This service makes it easy for merchants to have better shipping agreements. With the help of this service, sellers are in control of parcels at every point till the delivery is made to the customer. It also seems like Konga has ventured into the travel segment with Konga Travel. It is obvious that one outstanding feature of Konga is its customer centric approach which ensures every customer goes around with a smile afterwards. This has not just built the brand’s customer base but also increased its dominance. Want to build a lasting brand? Send us an email at wecare@mapemond.com and let’s show you the route to sustainability. Whenever and wherever e-commerce is the subject of discussion, Amazon is one name that would always be mentioned. Without a doubt, it has become an unbeatable name in America and all over the world. What started out as an online bookstore has grown to encompass the sale of many other items. Its expansion strategy has set it to become one of the world’s leading e-commerce site. Amazon has become a trusted platform for both buyers and sellers who do not hesitate to express their satisfaction with the services rendered. This air of satisfaction among their clients is one thing Amazon never waste an opportunity to boast about. The attribute of ingenuity in customer’s satisfaction is proudly expressed on the brand’s logo. 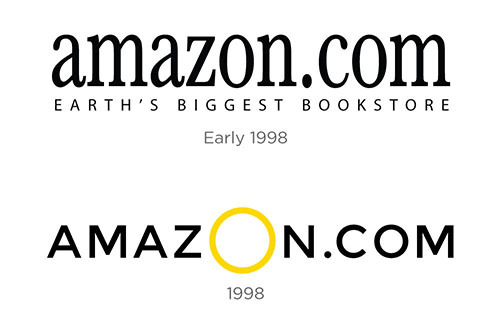 The simple, yet sophisticated look of the Amazon’s logo now carries with it the story of growth and success of the brand. When Jeff Bezos, the founder, established his online bookstore first under the name, “Cadabar” in 1994 and a year later changed to Amazon, the logo did not seem as exciting as it is presently. The initial attempts to brand the company and give it a face was not as remarkable or polished as what we have become accustomed to. The first logo prototype featured the letter “A” boldly designed as a winding river cutting through its silhouette and superimposed on an aquatic background. Though this logo did not sell the brand completely, still it set the sail for the company. Subsequently, other variations of the first logo were designed. The other logos were experimented with different colour schemes, icon fills and choices of typography. In 1997, the wordmark had extracted the capital “A” icon. This version of the logo had both upper and lowercase. Amazon took a new direction in 1998 because of its exponential growth. As part of the revolution, the company had to redefine its identity to differentiate it from other online shopping platforms and make it stand out in its industry. Amazon was one of the first e-commerce sites to incorporate one-click shopping and email order verification. The company’s services provided convenience for shoppers with a comprehensive stock of books. This successful phase extended the company’s model to include an audio library. With over 125,000 titles searchable by artist, song title and label, the music section would debut on Amazon. Following the expansion, there were a series of iterations on the logo to suit the rapid growth of the company. The iterations would include a lowercase serif logo paired with a book and globe icon. With the future in view, the company’s ambitions were reflected in its new tagline “Books, Music & More” This logo would remain in place until the company had time to expand on the “More” part of the vision. Due to the diversity of the company, more changes were made; this included a sans serif, all-caps wordmark with a large, golden “O” in the middle. This version lasted for only a few months before being redesigned into the sans-serif, lowercase font. In 2000, Amazon was gaining more visibility but rather than be complacent, Jeff Bezos constantly sought for ways to improve the company while exploring innovative ideas. The company gradually transited from consumable media into almost every product in the planet. To mark this new feat, Bezos desired a new logo – a timeless one that would bear the company’s message. To achieve this, he implored the help of Turner Duckworth, a creative agency that gave the company’s identity a tremendous facelift. 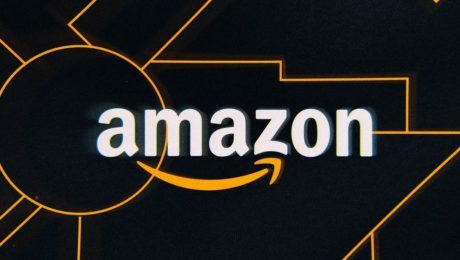 The current emblem came with new success; with the swooping yellow arrow that points from the “a” to the “z” of the logo, which explained the founder’s original plan for Amazon. The shape of the arrow has a round-edged, organic quality, and the right side bends the bottom stem of the “z” upwards. This symbolises a smile to represent the stellar customer experience the company is known for. Apart from the smile interpretation of the logo, the arrow from “a” to “z” also means that Amazon sell everything from a to z. That is, almost every product can be found on the Amazon store. The Amazon element is designed with a custom font, which resembles Officina Sans. This font gives the wordmark “amazon” a bold face. The well-crafted wordmark has become a recognisable identifier related to the brand. 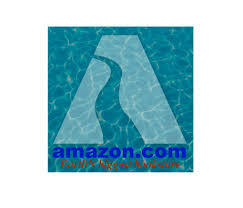 Amazon’s logo with no word said, spreads the message behind the brand. At just a glance, it sends signals to each viewer. The logo also serves as a reminder to both clients and staff. For clients they are assured of having a stress free customer experience whenever they make purchase on the Amazon site, which eventually leaves a smile of satisfaction on their faces. On the other hand, the staff are reminded that they have to ensure that every service or product meets the customer’s taste and satisfy them. Amazon remains a leader in its industry, a timeless brand, and continues to evolve. From online retail, with everything from ebook readers, to delivery via drones and terrific automated hub that manages its ever-growing inventory of products. The company has never conformed to the norm and has always tied its progress and innovation to its logo and collective ethos that was inspired by the founder. With the fast rise of technologies of all kinds – the simple and the sophisticated – the world’s advancement clings on technological wings. A country’s development is now measured by its level of technological growth and input, while humanity relies on it for easier and better existence. This leaves one with no other choice than to embrace the innovations that come with technology. An aspect of technology that has gained its way into our lives is software applications that tend to create more ease in operating technological devices. Globally, many new and modified software are being developed every single day to ensure more users leverage technology. Nigeria is not left out of this rave as many organisations and start-ups constantly search for ways to proffer technological solutions. Since 2009, Cinfores Limited took up the challenge and has so far, made laudable impact in the society. Here is an overview of Cinfores. 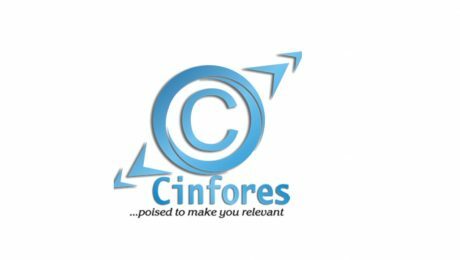 Cinfores Limited is a rapidly growing Information and Communication Technology (ICT) company in Port Harcourt, Nigeria. It began its journey with the aim to design software and offer educational solutions and services in the world of technology. The company was founded by Asawo Ibifuro, Nwogu Ikechi and Saborogha Boneri who got connected during their days at the Rivers State University of Science and Technology and were driven by similar purpose. Together these three like minds have dedicated their time, resources and knowledge to build the iconic company, Cinfores. For over a decade, Cinfores Limited has been committed to developing relevant solution-oriented software one of which being its flagship e-learning software – BrainFriend. This software, which has become a recognised brand, is considered Nigeria’s first examination preparatory and self-development tool. This educational software is designed to enlighten and guide students preparing for any type of examination in a way reducing failure. The company has also earned the title, the CEO’s trusted adviser because of the solutions it provides for executives on ICT investments. The products and services offered by the company are geared towards sustainable development with keen attention paid to quality. 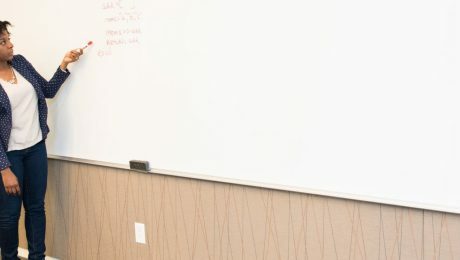 They deliver services in areas like software development, application maintenance, business process modelling, system computerisation, ICT infrastructure, web hosting, networking and general ICT consultancy. In the course of time, Cinfores has consciously gained immense experience in many aspects such as campus management and administration; scholarship management and administration; membership management systems, and administration of electronic screening tests etc. It has gradually deepened its root in different sectors in Nigeria, thereby becoming a leading brand in its own sector – ICT. At Cinfores Limited, they operate with a transparent structure that is constantly enhanced and improved and work with a genuine interest for their clients. Cinfores’ production strategy revolves around creating valuable products and services that are of high quality and cost-competitive. To increase their relevance, the company’s products are designed with sustainability as the end goal. They work in line with the Sustainable Development Goals (SDG), and strive to develop and maintain innovative technological ideas. As mentioned earlier, Cinfores is focused on finding solutions to different societal problems. They have employed this strategy in different organisations ranging from educational institutions, to governmental establishments and down to private organisations. Here are some solutions it has provided to tackle loopholes in these areas; Cinfores BrainFriend, Cinfores ecampus, Cinfores esms, Cinfores eskool, Cinfores examiner, and Cinfores erecruitment. Amongst many impactful projects Cinfores has embarked on, the introduction of BrainFriend in 2016 was an exceptional one. The brand’s fame increased with the release of an enhanced version that featured video & animated lessons, instructional dramas & educational games, over 70,000 questions/answers/explanations in line with the national curriculum and over 59 subjects and lots more. This innovative input in the educational sector has had tremendous impact in the lives of students and the country at large. Symbols have long been a great way for brands to communicate their values and generally express what they do. Some brands have become widely known for their distinctive logos. For Nestle, the peculiar nest and birds’ symbol has formed its identity. The Nestle logo is one of the few logos that never cease to make a statement about their brand to everyone who encounters it. It is regarded as a ground-breaking logo that has set the pace for other brands since its creation. Let’s delve into its history to see the logo transformation. The premier logo that was used in 1868 was simply the Nestlé’s family coat of arms. The symbol was a bird on a nest, placed inside a shield shape. Based on the type of brand Nestle wanted to build, this logo was not suitable for it. The emblem did not communicate the company’s vision in any way and that led to the need for a better logo. In 1875, Nestlé’s founder, Henri Nestlé drew inspiration from his family’s coat of arms to create a fresh logo for the brand. This new logo featured three birds in a nest, being fed by their mother. 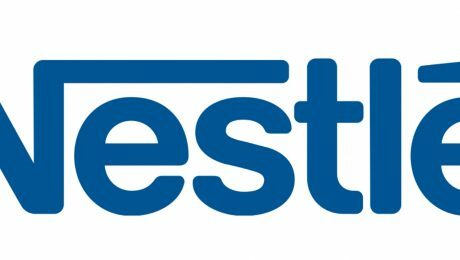 The symbol was a visual connection between the family name, Nestlé, which is interpreted as nest in German and the company’s infant cereal products for nourishment. With this move, Nestlé was rebranded to symbolise a safe nest for nourishment. 1938 came with a new swing of change; Nestle combined the lettering and logo to create a new identity for the brand. This unique mark unified all Nestlé products. The company’s trademark was modified in 1966 during the celebration of the company’s 100th anniversary. In 1988 one of the young birds, as well as the worm in their mother’s beak were removed giving the brand a new identity, This was to communicate that the subsidiaries were given homogenized names in combination with “Nestle” which then became a strategic umbrella trademark. In 1995, the logo was simplified again and the four categories of products, milk product, ice cream, confectionery and baby milk were all given specific Nestle lettering. The company made some modifications in the logotype in 2015. The logo was made bolder with other slight changes to the sketch. According to the company, the new Nestle symbol was designed to appear better on digital devices like smartphones. Nestlé’s wordmark is written with sans-serif type with much emphasis on the letter “N”. Initially brown-and-white were the only colours used to design the original logo but over time, colour schemes like grey-and-white or black-and-white are now being used. In years to come, consumers all over the world will always remember Nestlé’s emblem with a sense of familiarity and fondness knowing its products never failed to meet their expectation thereby reflecting its brand value, “Good Food, Good Life”. This is the real definition of logo impact. 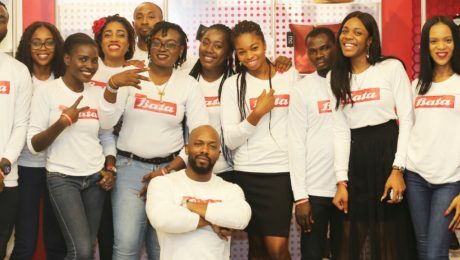 There is a new rave in the Nigeria footwear industry, and Bata seems to be at the center of it all. For those who probably mistook Bata for either a Yoruba venture or an Igbo business, you might need to sit down for some shocking revelations and hopefully you will get a paradigm shift at the end of this article. Moreover, it is not new to the Nigeria market. 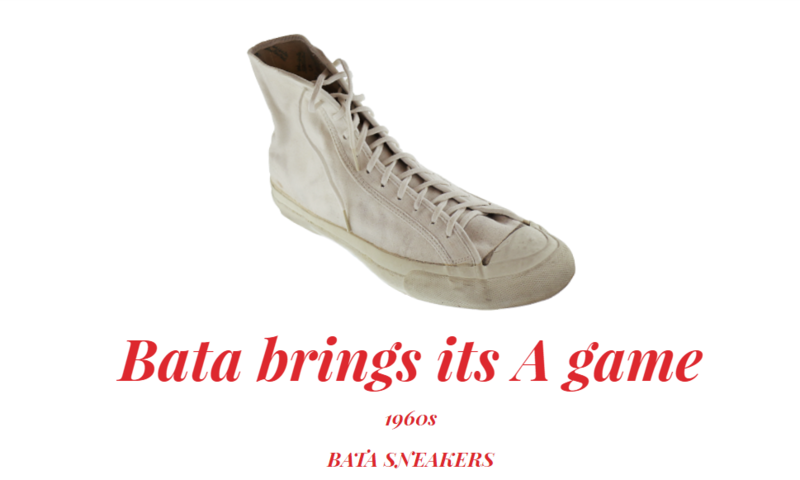 You might probably be amazed that the Canadian multinational footwear and fashion accessory manufacturer and retailer, Bata, has been in the Nigerian scene since 1932. 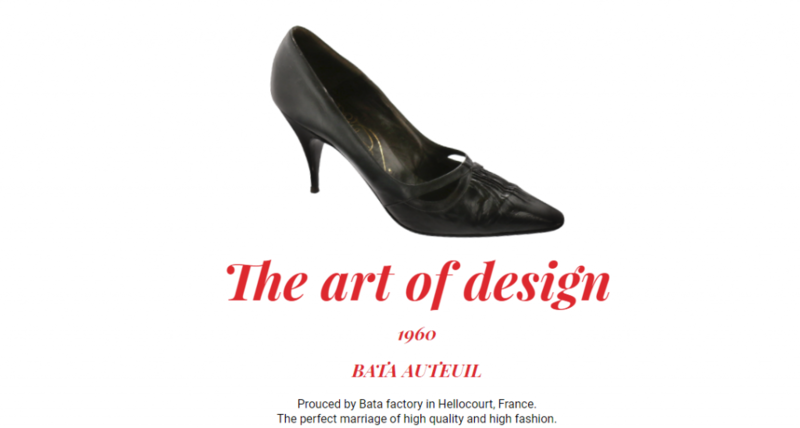 Bata also pioneered projects that developed the Nigerian shoe industry. On the shores of Zlín Czechoslovakia in August 24, 1894, Thomas Bata established the shoe factory that, within a decade, became a leading shoe manufacturing company in Europe. 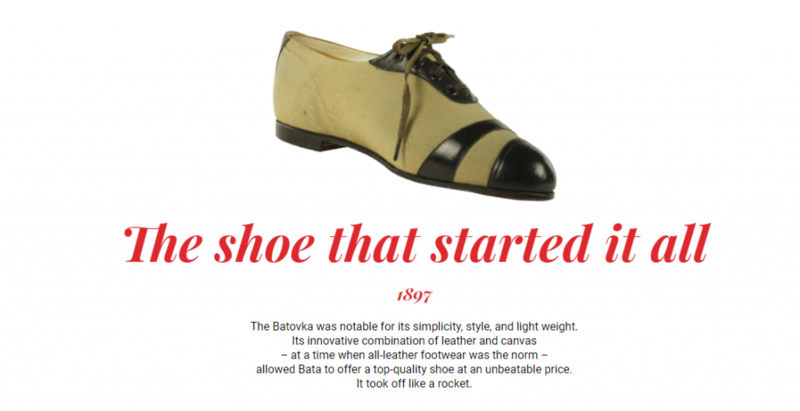 Bata Shoe Company’s dominance then and now is associated to their smart entrepreneurship, mechanization and competitive pricing. Following the global economic slump that arose after World War 1 in 1914, the company experienced some challenges due to the instability – currency devaluation and massive unemployment – in the new country. Because of this, there was less purchase of products, which led to a cut back in production. Unshaken by this setback, Thomas Bata came up with a new strategy to tackle this economic crisis by drastically reducing the prices of all the shoes. As expected consumers responded speedily to the price drop which increased demands for Bata shoes. This saw the closure of many rival shoe manufacturers, in 1923 and 1925, who could no longer meet up the demands that came with the crises. While this was happening, Bata gained more grounds and relevance. With this successful outcome, the company purchased several hectares to build a factory town, known as “Bataville”. Within the location, the company had grouped tanneries, a brickyard, a chemical factory, a mechanical equipment plant and repair shop, workshops for the production of rubber, a paper pulp and cardboard factory, a fabric factory, a shoe-shine factory, a power plant and farming activities to carter for food and energy needs. 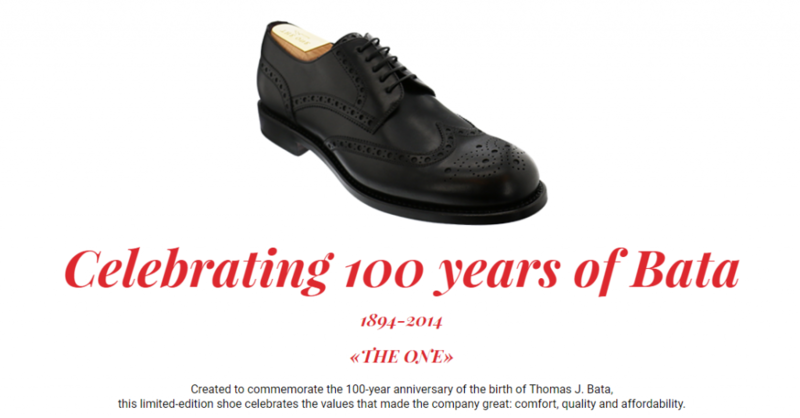 Despite the death of Thomas Bata, the founder, in 1932, the company waxed stronger, increased the quality of shoes and remained a leader in the shoe manufacturing industry. This growth did not end in Czechoslovakia, it also expanded and built factories in other countries – Poland, Latvia, Romania, Switzerland, France, etc. 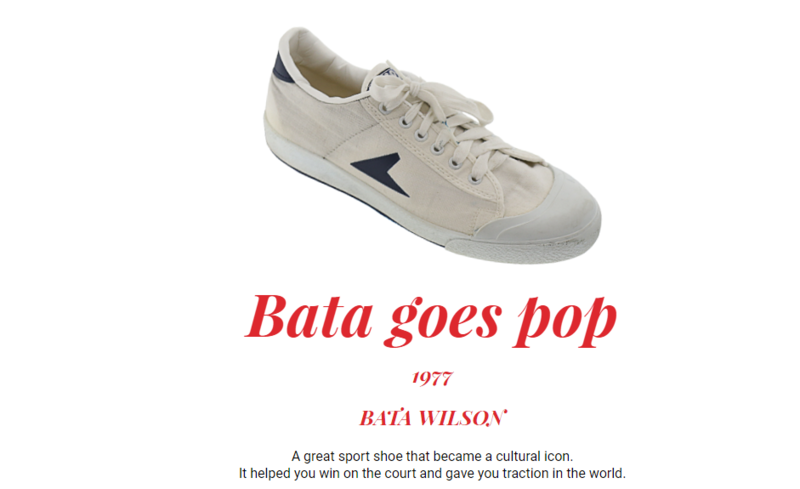 In 1964, the Bata Company moved their headquarters to Toronto, Ontario, Canada. In 1965, it moved again into an ultra-modern building, the Bata International Centre. The building, located on Wynford Drive, in suburban North York, Ontario, Canada, was designed by architect John B. Parkin. Nigeria was also in the plan. The company graced the Nigerian soil since 1932, became a major trader and manufacturer in 1964 popularly known as Bata Trading Company and subsequently in 1998 changed to Bata Nigeria PLC. The company spearheaded the development and modernization of shoe manufacturing in Nigeria and maintained tanneries for the processing of leather and allied products such as wet blue. It also instigated the model for local tanneries that were designed in line with the socio-cultural structure of many third world countries and ethnic groups across continents like Africa, Asia and the Middle East. Unfortunately, due to unfavourable business policies, the company exited the Nigerian market in the 80s. These policies affected the company’s operations and made it less effective. Even after its exit, Bata Shoes Company had left an unbeatable legacy and a gap that no other shoe manufacturer could replace. However, the company recently announced its comeback to the Nigerian market, with a one million naira launch for a factory complex in Abuja. The company’s Nigerian stakeholders are leading the project that is scheduled to start operations in June. They believe this would tackle problems related to shoe importation in Nigeria. To grow as a dynamic, innovative and market driven domestic manufacturer and distributor, with footwear as our core business, while maintaining a commitment to the country, culture and environment in which we operate. To be successful as the most dynamic, flexible and market responsive organization, with footwear as its core business. 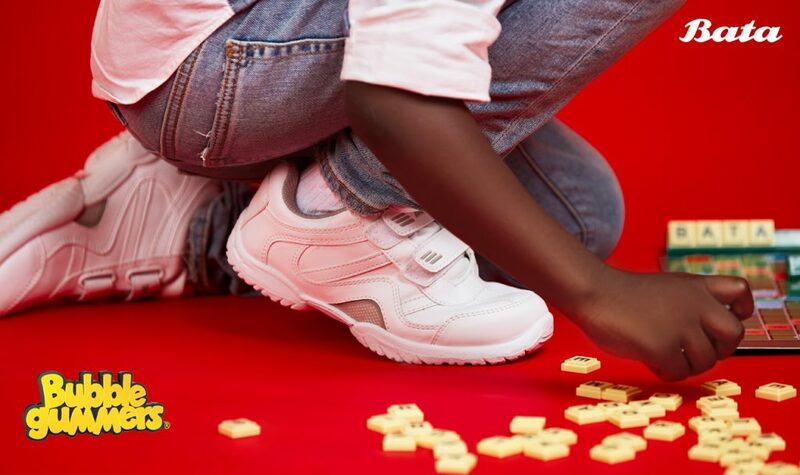 Asides giving the shoe manufacturing industry in Nigeria a facelift, Bata looks forward to reducing the unemployment rate in the country by training and employing 128 youths from Nigeria. These set of qualified individuals will be responsible for managing the production in the factory. Based on the quality Bata has been known for, Nigerians can be assured that the brand will continue to deliver exceptional products and in turn give them value for their money. We hope this article has enlightened you in some way. We would love to read your comments, if you do not mind sharing. After several months of deliberations and restructuring, the long awaited merger between Access Bank and Diamond Bank finally came to an official conclusion on April 1st, 2019. This merger is by far one of the most remarkable mergers in Nigeria’s banking history and has placed Access Bank as the largest retail bank in Africa by customer base. Access Bank stated that the new brand which is recorded to have over 27000 staff spread across 592 branches in 12 countries distributed in 3 continents with over 29 million customers, has always been part of its vision. 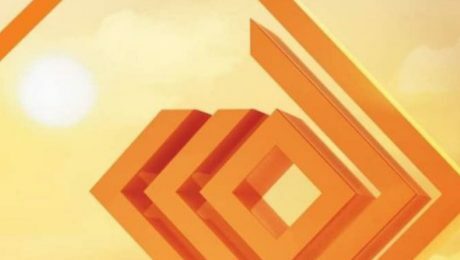 Following the successful merger between the banks, the values of the both Access Bank and Diamond Bank were combined to create a new visual identity. The CEO, Herbert Wigwe, emphasised that the brand’s new identity is built on the long lasting philosophy with the vision to be the world’s most respected African bank. The new logo is designed in two colours- a dominance of the well-known orange colour which will be used in corporate application in order to retain the sense of familiarity among Access Bank’s customers while the diamond colour palette will be used in its retail application to ensure continuity for retail customers. “The retention of the access typeface, colour and font is complemented by the orange logo, which draws from the colour palettes of both banks”. Accompanied with the new logo is the new tag line, “Access. More than Banking”. They refer this slogan as their philosophy and a promise they will work to keep. At the sight of clustered school kids in the peak of an afternoon or at the close of school, there is high degree of certainty that an ice cream vendor on a bicycle is available making a good sale of different Fan Milk products. On the menu of many adults who are health conscious but still crave for sweetness, Fan Milk is usually their preferred yoghurt brand. Its variety of products are also listed as one of the most patronised in any dairy outlet. Since its emergence in the dairy market, there is no doubt that Fan Milk has made tremendous impact in the lives of its consumers and the society. Most often than not, it is considered as one of the most influential brands in its industry which is an attestable fact largely. 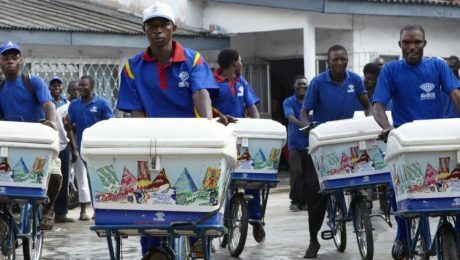 Interestingly, Fan Milk has gained a large customer base with little or no adverts and has remained a threat to other dairy manufacturers in Nigeria. Today, our review explores the brand delighting the taste buds of many across the country. It would come as a shock to most consumers that their favourite dairy manufacturer, Fan Milk PLC, has been churning out its products since1963. Though founded by a Danish merchant and industrialist Erik Emborg, the business has always been Nigerian based with the first factory established in Ibadan and a distribution centre in Lagos. The company made its major sales through bicycle vendors who got their supplies from smaller depots. During its early days, the factory depended on imported milk powder to produce it fresh milk and subsequently focused on white milk, chocolate milk, cottage cheese and set yoghurt as its product range. In a bid to increase its customer satisfaction, in the 1970s, Fan Milk introduced other products such as yoghurt drink, ice-lollies, ice cream and a new packaging technology, Tetra Pak. The company experienced a good financial outcome and recognition due to the success of the new products in the market. To gain more grounds, the company commissioned its second dairy factory in 1981 in Kano and has since then spread to different parts of the country with many depots and outlets to its name. This strategic move increased both its customer base and visibility in the country. Despite being a Nigerian based company, 96% of Fan Milk’s shares were owned by the foreign partner. Following a decree, The Nigeria Enterprises Promotion Decree, made by the government in the late 1970s, the company opened its investment platform to more Nigerians. As a result, Nigerians acquired 60% shares in the company. The1980s and 1990s came with some bumps such as the export restrictions, economic difficulties, devaluations and shortages of fuel thereby reducing the company’s speed and influence. Rather than dwell on the setbacks, in 1998, the company began to seek ways to remedy the situation. With the collaboration of the foreign partner and the Industrialization Fund for Developing Countries (Denmark) an agreement was reached which was to infuse more capital to enable the company restructure its finances, refurbish cold rooms, and increase the number of depots. Within that same period, the company introduced Fan Dango, a fruit drink which made irresistible waves in the market. Due to the expansion and rehabilitation programme, the company was again back on track. Following its desire to improve and reach more customers within the length and breadth of the country, Fan Milk PLC looks forward to introducing a better distribution system that will convert depots to mini distribution centres (MDCs) and franchise outlets. The new product delivery system is called Last Mile Distribution (LMD) and will focus on delivering products ordered via the hotline or online portals to customers in their shops. Fan Milk has also expanded to other countries in Africa like Ghana, Togo, Benin, Burkina Faso and Cote d’Ivoire. As part of its brand impact, the company has employed over 800 workers and has empowered thousands of bicycle vendors and other agents. Quality products with emphasises on the health benefits. Broad distribution chain that covers every kind of consumer regardless of their status and age. From our research, we accredit the brand’s success to its consistency regardless of the changing times and its distribution approach. With these, Fan Milk has made itself one of the most successful dairy brands Nigeria has ever known. A major problem business owners have with branding is that they delay the need for it. “I will start the business first and brand it later”, they say. But that’s like brushing your teeth without toothpaste and licking toothpaste later to make up. I know that illustration is a bit too extreme so don’t try to wrap your head around it. Anyway, practically speaking, when branding is shoved aside or kept at the bottom of the to-do list in business that could be classified as one of the most unwise business decisions. For anyone venturing into the competitive world of business, the first thing on your mind should be how to stand out from others who have been there. This is not to exaggerate but no business would stand out without slight touches of branding. No matter how basic, branding should be an intricate part of your business plan. For example, when thinking of your business name, also ask yourself if it will make a good brand name. Consider how the name will flow on marketing materials, souvenirs, stationery, and so on. It can be that basic and simple, even though branding runs much deeper than visual identity and communications. Though branding is a broad topic and sometimes seen as complicated, it is still doable and never farfetched. I’ve observed that some people try to avoid it with lots of excuses to give, from limited resources to lack of time. In fact once a conversation about branding is stirred they literally begin to enumerate all the challenges that would prevent them from taking actions towards branding their business. You may not have the funds, time or requisite knowledge to effect a full scale branding from the onset, but you should think ahead and lay the right foundation that you can build on later. I think it all begins from our understanding of what branding really is and that is why I urge you to learn more about the subject, by any means possible. One thing you should understand is that branding affects every aspect of your business – visual identity, product development, customer experience, employee relations, organizational structure, office administration, marketing communications, and so on. You cannot afford to take it for granted if you really desire to grow a sustainable business. When you lay a good foundation, you stand a better chance to survive the challenges that come your way. A whole lot of setbacks in business can actually be prevented from the beginning if the right branding strategies are employed. Wait no longer, now is the best time to start branding your business. 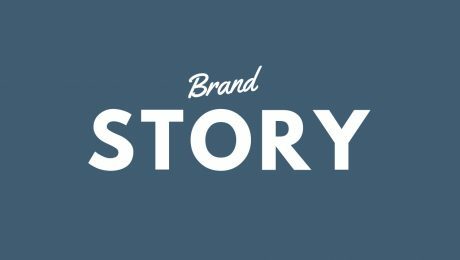 BUSINESS INSIGHT: WHAT IS YOUR BRAND’S HISTORY? If asked to narrate the history of your brand, would you be able to walk prospects through your timeline without skipping a vital detail? Have you ever really taken quality time to ponder on your brand’s story? Do you have an archive dedicated to keeping record of your brand’s progress? There are numerous questions pertaining to proper documentation of an organisation’s history that most founders hardly consider. In researching different brands for our weekly ‘brand review’ column, we discovered a trait common among over 70% Nigerian based brands, poor documentation of their history. While surfing most of their websites for relevant information related to the general structure of their organisation – brand history, core values, vision and mission statements, brand culture, etc – we found too little or no helpful information. Some business owners may consider the information as private and never see the need to share with outsiders, maybe they fear being copied by opponents, or they simply lack the skill of tracking progress. In contrast to this norm, we also observed a common practice among most foreign-based companies with branches all over the world; they have a keen interest in history. They could dedicate a whole page on their website to their company’s journey that they update regularly whenever the company accomplishes a milestone. Occasionally they boast of their history being their heritage and often urge prospective clients to study their different timelines in order to get a clearer prospective of the company. Asides this historical approach by great brands being beneficial to strangers, staff are daily reminded of the company’s history as well. They believe having a firm understanding of the past would inform present decisions that would in turn reform the organisation’s future. To them, every milestone is a dot that connects and leads them to their desired future. The basic essence of creating an accessible rich historical archive for your company is to gain more connection. The more people, both customers and staff, understand and connect with your brand’s story, it makes it more likely for them to stick around much longer. Studies have shown that most brands with in-depth history tend to last longer as they continue to strive to live up the legacy left by their founders. These companies seek different avenues to introduce an innovative idea as a means of staying relevant. Apple Incorporation is a perfect example of a company with a detailed historic background which is cherished by every employee. From when it was founded in 1976, by Steve Jobs and his partner Steve Wozniak, the company continues to thrive in the world of technology. Despite the death of its founder, Steve, the company with relentless effort towards innovation runs with the same vision but with an improved and modern sight. When you begin to see your business as an entity of its own, that its progress needs to be recorded per milestone, you evolve your business into one that should indeed be taken seriously. It is not enough to wish for a brand that will outlive you; you must make steps towards documenting every stage of the business with new improvements, as this would eventually form the company’s legacy over time. Start writing your history today! Universal Parcel Service is unarguably one of the world’s most remarkable package delivery company. Asides being one of the oldest package delivery and supply chain management companies known all over the world, its logo has continued to give the brand a bold and unconquerable face. 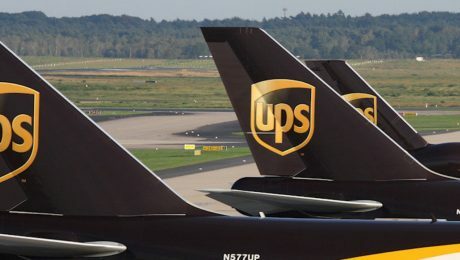 Though UPS has always kept its logo simple, it has never fallen short of communicating the company’s values to the customers. From the delivery trucks to each parcel delivered, the UPS logo leaves its stamp in the memories of people. The logo has added to the global recognition the brand enjoys. 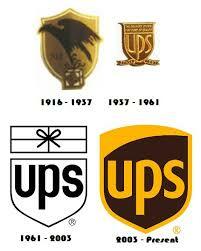 The UPS logo has so far experienced four transformations since it was designed over a century ago. At every point in time, as the company evolved with different market strategies, it ensured the logo evolved with it. 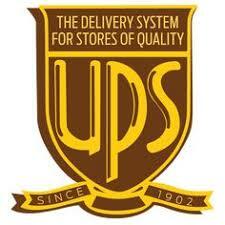 The first UPS logo was created the same period in 1916 when the company was established. The logo had distinguishing features such as an eagle carrying a parcel with its claws and the famous bronze shield. To further define the brand’s values, the words ‘Safe, Swift, Sure’ were written on the sides of the package. This logo symbolized the brand’s strength as regards its service. In no time, it became the company’s identity. Even though the first logo was remarkable, UPS needed something that would align with its growth. With this in mind, the company redesigned its logo in 1937 to match the company’s new goal. This logo has the letter UPS written on it but the bronze shield was retained. Following this change, the company’s slogan was changed to “The Delivery System for Stores of Quality” in order to get the target customers. In 1961, a new logo emerged which was designed by Paul Rand. The logo had a package tied with a string above the UPS shield. The aim of the logo was to highlight that the company’s core service was package delivery. This logo was designed by FutureBrand, a brand consulting firm. 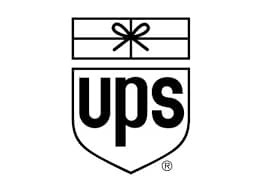 The new logo was used on delivery trucks and had a new font called UPS Sans. Brown has remained the colour that has distinguished the company since 1916. 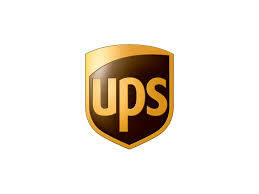 For UPS, the brown colour means elegance and professionalism, which also hides dirt on uniforms and delivery vehicles. UPS uses two shades of brown that are their registered trademarks. They are both used for their vehicles or clothing. Though there has been some proposals and research to change their famous chocolate brown colour, no other colour has been able to meet the company’s standard. Rather than change their primary colour, chocolate brown, the company adds brighter colours to it like red, blue and green to form a sort of colour palette. While they add these other colours, they also try to maintain the brand’s original identity. The simplicity of the UPS logo has beaten the idea of sophistication. While some brands seek to create abstract designs, UPS focused more on the message each logo passed to their potential clients. It has remained consistent with the shield identity that has also increased its popularity. With its simple but yet powerful logo, UPS continues to stand out.